This is what we came for: scenic lanes to explore. The object was to find unpaved roads. 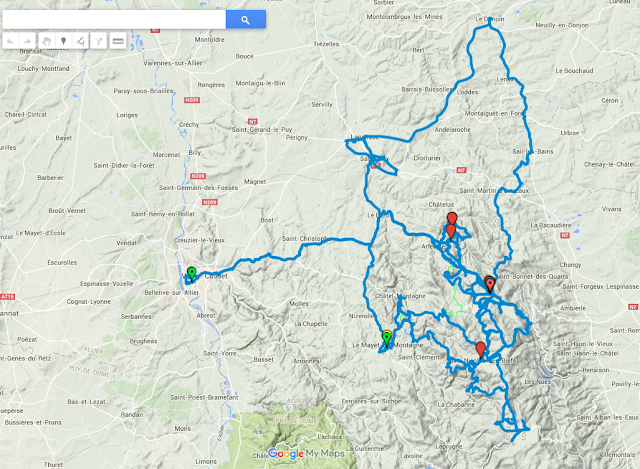 We had no idea what to expect, but after a while we found a way to use our gps and tablet to find the roads we were looking for. This is the view on the tablet screen(Maps.me). 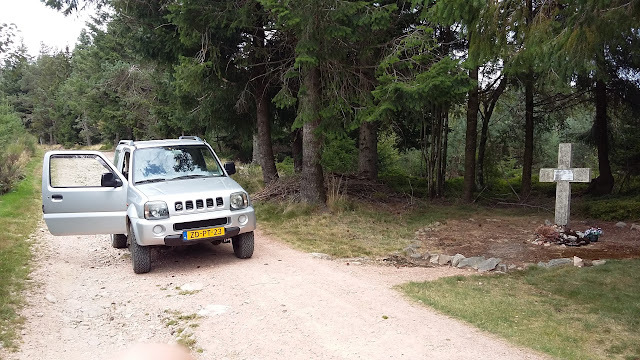 We found that we needed to look for the brown lines as they represented anything interesting from very narrow paved roads to unpaved roads and narrow forest trails. 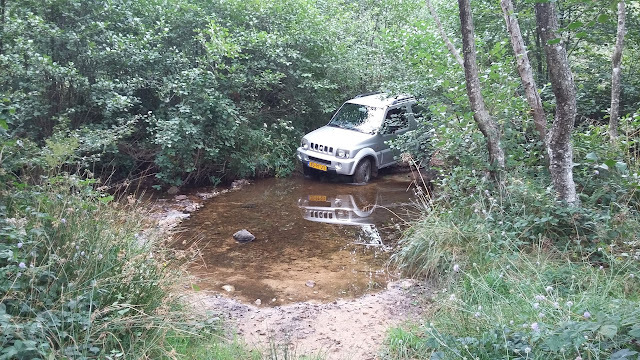 Sometimes a dotted brown line represented an "adventurous" route almost too narrow for the little Jimny. 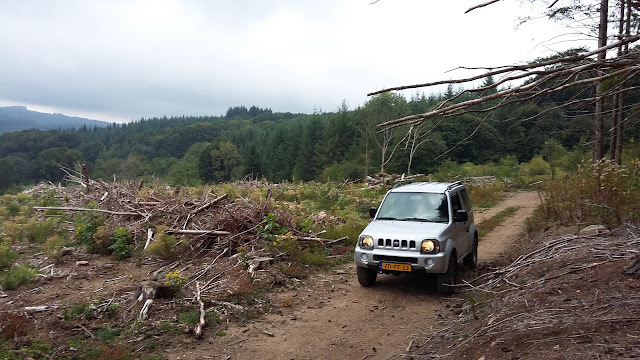 Being used to larger vehicles the Jimny was a pleasant suprise: it proved to be a very good vehicle for these trails and it's low fuel consumption was a pleasant bonus. Driving on the motorway was comfortable too! We could see these wind turbines from our lodgings, but it took us a while before we found the upward track to visit them. 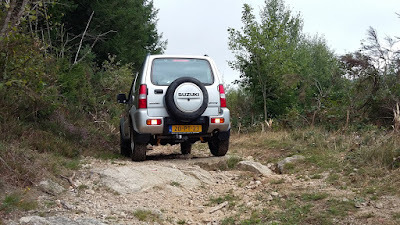 We found two other tracks in the next couple of days but one of them was so narrow, steep and badly washed out that we could only drive it down. Some of the tracks were quite wide and were probably used for larger vehicles to carry out timber. There were wide open spaces where timber had been harvested or cut down by storm. Suddenly the tracks would narrow and after a while you'd see a little stream or bridge. 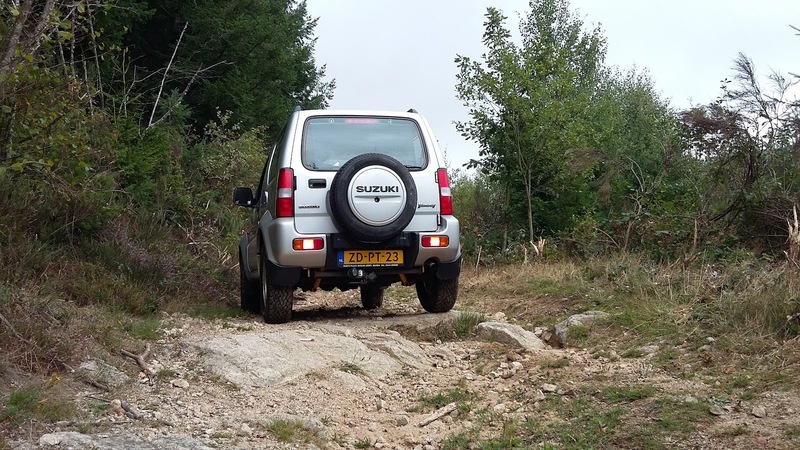 This was a nice little ford.Sometimes we could see wide tractor wheel tracks, but it seemed the road was still too narrow or anything wider than our Jimny. This slightly macabre "Calvarie" is at the top of a beautiful track up the "Puy le Roc". This is the track going up to"Puy le Roc"
Leaning stacks of timber everywhere. This track lead straight to our lodgings" Aire Les Biefs"
Of course there are interesting old towns to explore too. Like Vichy. Here I'm practicing "Clochard" in front of the old Roman church of Chatel Montagne. Once in a while we'd find an old car abandoned by the track. Near "Loge la Garde" we found several war memorials" Croix 22 julliet 1944" in the woods. In Saint Nicholas-des-Biefs a stern buste of "La republique" oversees the village square. At the village "Auberge" we enjoyed a good lunch. As I wrote earlier: some of the tracks are washed out a bit. 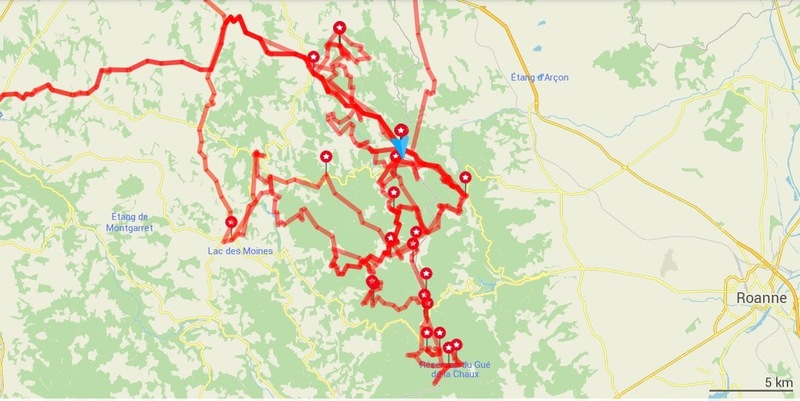 These are the GPS-tracks we recorded.